Throughout the years that I have written here, the one thing that became synonymous with my entries onto Original Sound Version was my many reports from concerts across Europe, most notably the productions of the German company Merregnon Studios. As we all develop and grow older, our time and place in life changes and as such, my time at Original Sound Version came to a close with new opportunities a few years ago. However, I never said my good bye to this little place which I called home and cherished, never tipped my hat to those who read my reports and reviews with great enthusiasm and support. So today, I say my good bye with a show that fittingly ended a great era, yet sparks new life into the world of orchestrated video game music. I say good bye with Final Symphony. In order to fully illustrate the meaning to me of what Final Symphony stands for and the meaning it has on the industry in my eyes, I quickly travel back to my very own beginning. Fresh off a life of great excitement and fatiguing emotional loneliness in South America, I had returned home to Europe in 2008 to find my own path in life. Being the son of an accomplished writer in my father, I had always avoided taking to the world of literature, but the apple fell too close to the tree, and I began writing to keep my mind healthy in my travels. In 2008, the announcement of a show based on the works of Chris Hülsbeck titled Symphonic Shades peaked my interest. 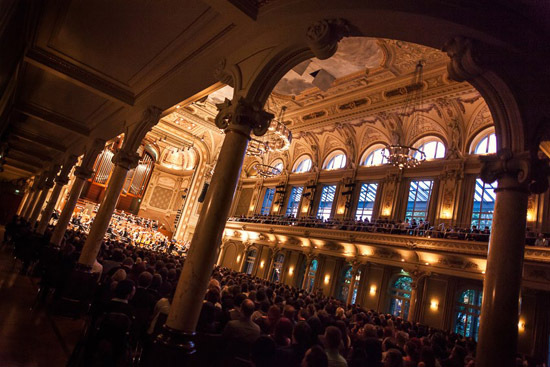 Being a lifelong fan of the composer, and having followed the developments of the then slightly mysterious Merregnon Studios, I saw my chance to travel to Germany for one night of celebrating my hero from childhood and to enjoy a unique and interesting experience with the orchestra. But what I found was something very different. As I sat breathless in the Cologne Funkhaus on August 23rd, 2008, I found my path. To me, video game music was in itself an entity that often surpassed the experiences of the games they accompanied. 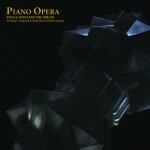 The composers, through the limited hardware presented to them in those days, often had their own stories to share, their own reflections to cast onto the player and as such, I would often find myself listening to the music more than actively controlling the characters, simply to get a feel of what was underneath the melodies. Symphonic Shades marked for me the very first time I experience this feeling, this experience, in an orchestrated form. Having attended orchestrated concerts in the past as well, I always felt the attention and presentation was focused more on cleverly edited footage on a screen, than the stories unfolding through the melodies by the orchestra, but here, it was a pure, translucent experience, one which everyone could enjoy without any prior knowledge of the source, exactly the one I had hoped to one day find. Following Shades, I began to attend each of Merregnon Studios’ new productions, eagerly awaiting them to overcome my expectations, wanting more experimental approaches, wanting nothing but the most unexpected turns and twist at the moment I would be at my most comfortable. With Symphonic Fantasies, I saw the stories of 4 of the greatest video game series ever made told through unique movements, transforming a mere symphony hall into a forest in despair searching for hope in Secret of Mana, a moment I will never truly forget. In Symphonic Legends, the orchestra itself became the beast inside of Samus Aran in Torsten Rasch’ modern and heavily controversial Metroid suite, in my eyes one of the boldest, and greatest, arrangements of video game music so far. Jonne Valtonen showcased what video game music can truly become with his 30 minute Legend of Zelda: Symphonic Poem that very same night, telling the whole story of Link’s journey and the challenges he faced in symphony. It is an accomplishment that no other production has been able to replicate, and as Valtonen would later prove, the only person that could overcome the accomplishment was himself. As Symphonic Odysseys took place in Cologne and Symphonic Fantasies began to travel across borders figuratively and literally, I began to wonder where one really could go next to keep the audience entertained. This was a production company that would always strive to venture beyond the norm, to always challenge the status quo that so often affects the video game industry as a whole, and to rather seize to exist than to go through the motions. But as I attended the smaller concert East Meets West, a joint production with the Soundtrack Cologne conference, an air of uncertainty waved over my head. Yes indeed, the music was fantastic, both the reprises of the past and newer additions from many additional arrangers, but was the spark still there to prepare for the very last in the series of symphonic juggernauts, Final Symphony? On the plane to Wuppertal, a quiet yet beautiful little remote town near Düsseldorf, I had many of these thoughts in my mind; “Have I grown out of this experience, the one that inspired me for so many years?”, “Will the 5 years of tears and amazement end in with a setback, artistically and emotionally?”. 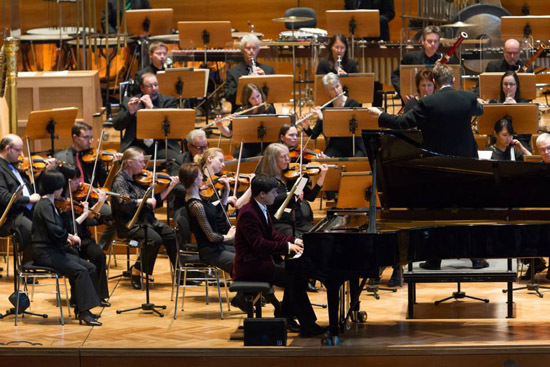 In Wuppertal, the stage was set for 2 concerts back to back in front of a sold out audience of 3000 excited fans from around the world, covering Sweden, Brazil, United States, as well as fans from all over Germany itself, coming to witness the debut of this final installment in a series that has in many ways defined how video game music is now perceived in the classical setting. The hall itself was a beautiful building, built in 1896 before seeing renovation in the late 1950’s. It is decorated with figures and creatures in bronze, and offers a very vivid, almost opera influenced character which lends itself well to one of the presentations in the program, Final Fantasy VI. After being initiated per tradition with an original fanfare by Valtonen, a dramatic initiations signaled by a powerful horn section, Roger Wanamo’s wish came true as he was selected for this piece, mentioning himself that the story and character themes in VI is his personal favorite, and it became an almost emotional struggle for him to choose what to keep intact in the piece as it was fitted for time. “Born with the gift of Magic” tells the story of Terra and her journey into her own past as well as the impending battle with the diabolical Kefka. Beginning with the famous opera scene’s “Overture”, it eventually blends into Terra’s Theme and showcases her restrained life and struggles without knowing her past with a sense of unrest in the vulnerable way the orchestra performs the piece. From here we are introduced to Kefka, an introduction we will none soon forget. Wanamo demonstrates a strong theatrical sense of melody by progressively intensifying “Kefka’s Theme”, not only in the sense of volume, but in style, tempo and intensity, as Kefka’s mind becomes more and more unstable due to his own swallowing madness, with a glimpse of unwarranted humor worthy of a mad man’s mind. An amazing moment in the overall suite, which goes onto Terra’s discovery of her Esper origin with Esper World (with “Hedwig’s Theme” also showing itself) and a light rendition of “Terra’s Theme” symbolizing her inner thoughts. A mix of “Protect the Espers” and “Battle Theme” sends the audience right into the heat of battle, as Kefka and our heroes come to the very final showdown, in the most heart blazing moment of the concert as the strength of themes equals and uncertainty rears its head, but as the music comes to a halt, the victor emerges, and “Terra’s Theme” comes to a full circle as she lives on, with her freedom now a reality. The “Overture” plays one more time, as the curtain closes to thunderous applause. In between these pieces, Winfred Fechner, the former director of the WDR Orchestra, took the stage and told his stories about his first encounter with video game music and its fans, his many humerous encounters over the years and the story behind of the video games presented with a true charm and jovial character that illuminated the man as he spoke. A true gentleman, he was beloved by the fans and cheered as he came on stage. 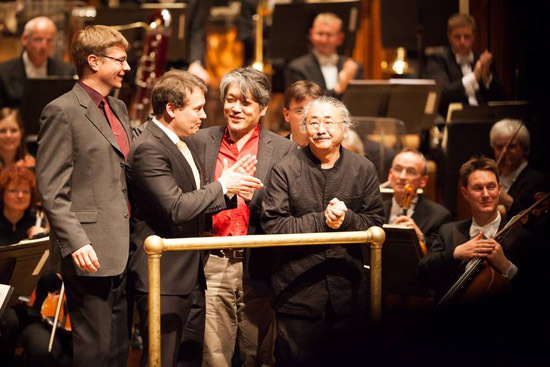 Masashi Hamauzu, the co-composer of Final Fantasy X and the next game showcased in the program was the arranger for the 3 movement piano concerto. For this, Benyamin Nuss was chosen to once again take stage, as he more than anyone truly captures the heart and soul of the music performed with his youth, energy and talent. 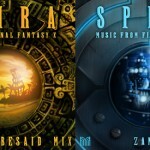 Knowing Hamauzu’s style, one is to expect that this would not be just an ordinary journey into the world of FFX. Rather, this is a live painting, with its ink being music, and the final picture being an organic shape of what we are familiar with already. An abstract creation with songs inter-weaved and familiarity being often mixed with vicissitude, Nuss began with his gracefulness to perform at the very top of his game. The arrangement that Hamauzu provides is in itself a direct reflection of his own emotions associated with the source material, and in my opinion, is an arrangement that truly showcases Merregnon Studios’ philosophies, by truly presenting a melodically told story. It is also a very Japanese themed arrangement as one would expect, emphasizing very strong melodies and sensitive’s, evoking colors rather than images. The combination of Benyamin Nuss and Masashi Hamauzu results in an incredible emotional spectacle, and one must truly be in the center of the colors cast around the room to fully embrace the whole picture. Enough cannot be said about this incredible piece. Jonne Valtonen spent months to prepare and accomplish the near impossible; to overcome his own achievement and truly revolutionize the field in which he paved the way. “Final Fantasy VII: A Symphony In Three Movements” is a 40 minute epica telling the entire tale of Final Fantasy VII, from the corruption in Sephiroth’s experimented mind to the love in Cloud’s life and the eventual triumph of good. The first movement, “The Nibelheim Incident” brings Sephiroth to the forefront, and similarly to Final Fantasy VI, tells a story of a chaotic mind escalating to a climax of madness, but unlike Kefka who spirals into never ending lunacy, Sephiroth’s story comes to a halt of enlightenment, an embrace of his insanity, setting the stage for a much more sinister tale. 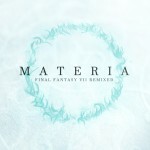 With the introduction of the world and the character of Sepiroth, the long awaited treatment of “One Winged Angel”, but here, it was not played for the purpose of fan servicing, but rather for story impact and as a result, the long time favorite of most Final Fantasy fans around the world has never sounded better than here, serving a deeper purpose. It is not only in a sense majestic, but also unsettling, dirty and at times conflicted as Sephiroth ventures through his unstable mind, with the use of some clever orchestrations by Valtonen. His defining moment however, was yet to come. “Words Drowned By Fireworks” begins the love triangle of the story, and Cloud’s own struggles of who he feels for, and to deal with his love. The 3 themes of Main Theme (which serves as Cloud’s theme in this story), Tifa’s Theme and Aerith’s Theme plays out the different characters as they interact with one another. While the love is a prominent theme in this movement, it is not necessarily one told through happiness, rather it has an underlying tension of melancholy that can always be felt, and it as the true defining moment approaches, the bond shared between the characters are never fully developed due to this tension, a painful love at times. As love almost meets between 2 parts, the feeling is interrupted by a grand display of fireworks, one heard entirely through ingenious work with the orchestrations, and the parallelism is evident here that this moment is not only a defining moment for Final Symphony, but also a celebration in reflection of Valtonen’s own achievements as he now ventures on himself. As the “Main Theme” and “Aerith Theme” interplay at a stronger pace, suggesting what could be Valtonen’s conclusion of who the main character truly loves, happiness is brought to a sudden end as glimpses of “OWA” returns to cast chaos on the two themes , and the last breaths of Aerith is heard through cold, weakening strokes on the first violin to end the movement in the most desperate and hopeless of times. The third and final movement “The Planet’s Crisis” reassembles our heroes to reassert their purpose and to rid the world of the impending doom that it faces. The piece begins with “Countdown” which shades into Cid’s Theme before unifying the story with “Cosmo Canyon” and “Great Warrior” in one of the most emotionally engaging moments of the concert as these themes have long been wanted to be heard in an orchestrated fashion. The great battle between evil and good is heart pounding and enthralling, never once letting the listener letting his own senses down with hard percussion hits and incredible brass sections. This is a final battle to behold, one which is not a mere demonstration of themes to represent victory at every corner, but a true struggle that never lets up through pieces such as “Perfected Jenova”. Good finally emerges victorious and the lifestream awakes to breath, showing short glimpses of the moments we visited over the last 40 minutes, the movement ends in “Bliss”, though as this is a story of loss and struggle, it does not end on a note which evokes great joy, but rather with a feeling of victory that had great sacrifices. For the encore, 2 themes were selected. From Final Fantasy VII comes the first encore “Anxious Heart”, a beautiful song with the Final Fantasy “Prelude” arranged alongside it for a more straightforward fare. The second encore begins with “Fierce Battle” from Final Fantasy VI to tease the end with a great battle theme, only to be interrupted as so famously we’ve seen in past concerts with “Mog” for a bombastic and humorous end, sending the audience into a daze of applause and screams. While the choice of “Mog” at first did not come natural to me as a show closer, I would eventually come to see it as the absolute perfect end, illustrating the fun in the games, and in life after a long, dark 2 hours of grand compositions and arrangements. With the success in Wuppertal being a fact, the journey went onwards to London for a true history making milestone. 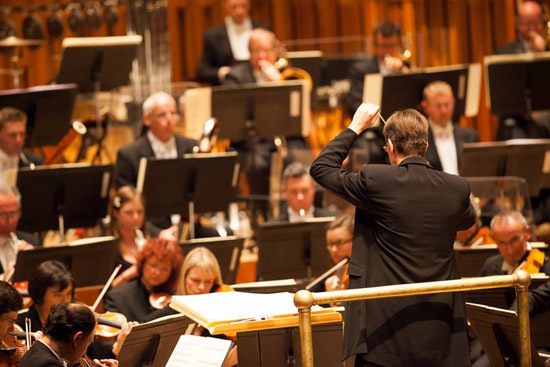 On May 30th, the London Symphony Orchestra would for the very first time perform a live concert based on video games with Final Symphony. 2500 fans arrived at the Barbican Centre, unable to contain their excitement to see Final Fantasy unfold as never before heard. Some wearing costumes, some bringing along their loved ones, others bringing their prices possessions to have signed, the night was building with a crescendo of excitement that was infectious. With the Wuppertal Symphony Orchestra, Final Symphony had been an amazing show, though in some aspects through the orchestra more technical than emotionally driven. With the LSO, an orchestra famed around the world for their work on soundtracks for Star Wars, Indiana Jones and many other legendary movie soundtracks, the music of Final Symphony began to take shape with a quite stark contrast than the performance seen in Wuppertal. 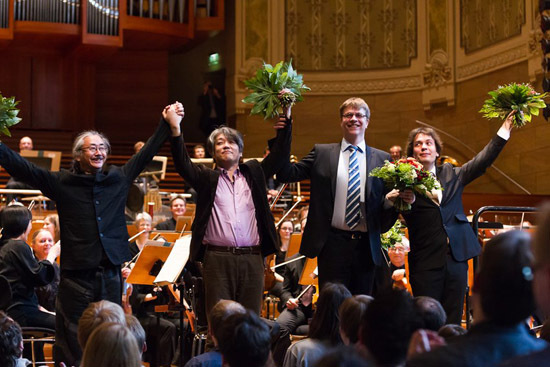 In London, Final Symphony came straight from the musical hearts of each and every performer, as the works of Jonne Valtonen, Roger Wanamo and Masashi Hamauzu challenged, and excited them and conducter Eckehard Stier led them masterfully, and engaged them and the audience with his brilliance. To simply state LSO as a great due to their repertoire of film works would be to understate their brilliance as an orchestra. The LSO plays by throwing themselves truly into the scores which they play, and lead by emotion rather than technique with the result being something none other orchestra in the world can match. 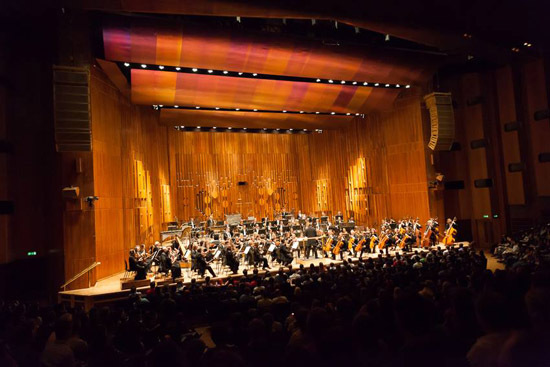 As Final Symphony once again made its way through, the London audience combined nations from all over the world once again representing all ages and background, simply to witness the LSO perform live. As the famous themes came to life, 2500 smiled in unison. As tragedy struck, 2500 sat with despair in their eyes. For them, this was not just a concert, but an adventure which they thought they knew, but only now began to see fully formed. As the 2 final notes were played, my own being was in a complete haze of overwhelming emotions. My vision blurred by the many tears that I had now cried from seeing the people I respect and endear so much stand on stage to a standing ovation, they themselves unable to hold back on their own tears. My thoughts raced at a thousand miles as I tried to find words to myself what I felt, what I was experiencing in myself as I stood there on my own journey, now older and experienced. But a thought came to me as clear as day as I looked up on stage; I had just witnessed the greatest moment in video game music history, and every tear and heartbeat from the audience belonged to those on that stage. Final Symphony is not only an accomplishment for video game music, but it is a showcase that music, any music, can truly be transformed into worlds that the listener can travel within. Here, images are more vivid than any video screen can shine from the projector, and words can never fully comprehend what we feel, the music does that for us. 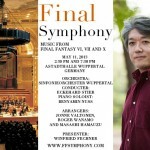 With a slight irony, Final Symphony does not mark the end, but rather the beginning as video game music no longer can just be presented as a trip of memories, now they must be able to tell the stories they hold within the melodies. As I write these last passages, I once again sit on a plane heading to my next destination. I ask myself this same question, “have I grown away from this experience?”. The answer is that I have not, I have matured, and with Final Symphony, video game music has matured with me. Such a wonderful article! I had the big pleasure to attend both Symphonic Fantasies and Symphonic Odysseys in Germany and it was absolutly stunning. Thanks to everybody involved that made it possible! oh man that sounds amazing, wish i could’ve been there; I hope they’ll release a CD. 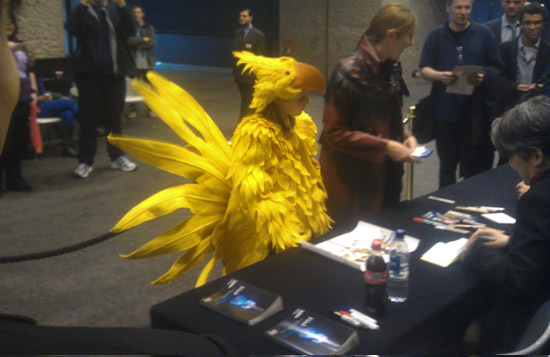 Not concert related, but one highlight was the Chocobo girl cosplayer. She looked cute enough in the excellent costume to get alot of attention, but her in-character squak whenever people would have a picture taken with her was incredibly manipulative :p.